Founded in 1989, WITI is the leading trade association for professional tech-savvy women worldwide and is committed to providing every tool, resource, and connection you need to thrive and succeed in your business, profession, and career. On the day the news broke about Carly Fiorina leaving HP, WITI was inundated with calls from the media. This was and is a BIG story since there continue to be so few women heading major corporations; everyone had a different view of what happened and of Carly herself. Since I have been asked so many times to express my view of Carly and what occurred, I realized there was no better place than WITI to state my view for the record. As many of you know, from the moment Carly first took on the role of CEO of HP and became one of the few women CEO's of a major company - and one of even fewer female CEOs of a major technology company - Carly regularly announced that her leadership, skills, style and success had nothing to do with her being a woman. Sessions like "Martha's Jailed, Carly's Gone: What Went Wrong or Are Women Just Getting the Blame? ", "Tools for Business Networking" and "The Money Conversation"
Register before March 1st with promo code "buildT" to receive an additional $100 off the registration fee AND a free WITI t-shirt. Has someone mentored you toward achieving your career dreams? Nominate your Corporate Champion before March 1st to see them recognized at the National Conference! Exhibit space and sponsorships are still available. Last summer Women For Hire ran a national contest enabling women to enter to win the chance to meet with CEOs and senior executives in a wide range of industries. We had 55 winners, and I had the privilege of calling each one of them with the good news. Every single winner was shocked, totally shocked. Some said they weren't even going to enter because they didn't think they had a chance of winning. My favorite line came from a seasoned electrical engineer who said, "My gosh! I didn't think I had a hope in heck to be selected." WITI Talk TeleClasses: Transforming your Future! Are you ready to transform your life and/or your career, but need help figuring out "what next?" Do you know that there must be "more to life," but you aren't sure how to go about finding it? Do you want to explore what your life purpose is so you can create a "Mission Statement" for your life? Have you created a Mission Statement for your life, but don't know where to go from here? If you answered YES to any of these questions, please join us for a WITITalk Teleclass. Participants in these teleclasses have made major changes in their lives, after just the first class! WITI Members: Visit the Members' Area for promo codes to receive an additional $25 off this TeleClass! Register now! High-peak performers are constantly setting goals about possible and probable outcomes for their future. They are consistently breathing life into their dreams and desired outcomes for their life via their goals. We are here not to just be who we are, but to be more of who we are! Financial goal setting allows us to do this and much, much more. By popular request, we have expanded the Member Profile and Member Search benefits! To faciliate networking among WITI Members, we've made it possible to search the Member Directory for individuals by industry, expertise, education, and more. Check out the improved Member Search. And be sure to update your Member Profile. WITI networking just got more powerful! WITI is now accepting submissions for publication! Publication is an excellent opportunity to earn increased visibility and recognition as an expert in your field. WITI gladly accepts submissions for publication on our web site or in the Strategist, our bi-monthly eNewsletter. For more information or to make a submission, please visit the Members' Area. Not a WITI Member? Join us today! February is Heart Month. Did you know that heart disease is the #1 killer of women today? Read the latest from Mellanie Hills to learn the woman-specific heart attach warning signs. The DaimlerChrysler Board of Management has recently announced the appointment of Karenann Terrell as Vice President and CIO, Chrysler Group and Mercedes Benz North America. Ms. Terrell was previously Director - Managed Services & International Process Systems. She has also served as Director, eConnect Platform, where she oversaw all e-Business activities for the product and consumer side of the Chrysler Group. Ms. Terrell holds a Master of Science Degree in Electrical Engineering from Purdue University (1988) and a Bachelor of Science Degree in Electrical Engineering from General Motors Institute (1986). She is also a member of the WITI Advisory Board. Do you have an announcement or promotion you'd like to share? Use the form in the Member's Area to send us your news to appear in the Strategist and also on our website. If you prefer, you can also email the editor. What an immediate impact we could make if each of us decided to spend our business and consumer dollars on women-owned businesses - to find a coach, consultant, software vendor, dentist, conference-call vendor, phone service, computer and so on from a woman! This is what the WITI Marketplace is all about. There are over 100 businesses in the Marketplace so you don't have to search far to find the products and services you need! Search the Marketplace today! 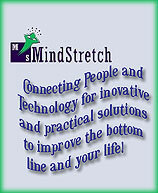 MindStretch is a technology training & people skills development company. The MindStretch focus is on putting together programs designed to enable professionals at all levels to Understand, Relate, Adapt and Connect with all types of personalities. A couple of years ago, The Gartner Group said "The greatest need for technology professionals today is interpersonal skills." We take this further; the greatest need for all humankind is to understand, relate, adapt and connect with one another. Our exciting new "Personality Diversity" program is designed to do just that. We invite all WITI members to experience the program and create long term sustainable success in their lives. Please contact Deidre or Leslie at 713-490-6500 or email [email protected] for more information and an exciting special for WITI members. Barbara Annis' book, Same Words, Different Language, on how men and women misunderstand each other at work and what to do about it is now published in 20 countries and is being translated into Arabic. All profits from the sale of this book will be donated to tsunami relief for those affected by the December tsunami in Southeast Asia. Women For Hire Career Expos Across the U.S.
Network face-to-face with recruiters from top employers at the Women For Hire career expos. Meet with companies such as Aon Corporation, Cbeyond Communications, General Dynamics, Southwest Airlines, Swales Aerospace, Tech Data Corporation, United Space Alliance, Verizon and MANY MORE! Free admission. Resumes and business attire required. Register today for a special early morning seminar prior to each event! Women For Hire CEO Tory Johnson will lead a networking session from 8:30 a.m. to 10 a.m. where she'll share inspiring and practical jobsearch advice. All attendees will receive a copy of our book, Women For Hire's Get-Ahead Guide to Career Success, and priority admittance to the career expo! Visit www.womenforhire.com to register. This award-winning leadership program is for women who have bold, audacious goals to accomplish but want to get there without sacrificing their health or family. Participants learn how to reveal and shift even the most deeply held beliefs that limit extraordinary performance in themselves and others. Each person brings a real-time work project that in turn that will yield a tenfold return on their tuition investment. Participants will leave with a world-class leadership skill set, a plan for accomplishing their project and a global community of support for sustaining what they have learned. Contact the Institute for Women's Leadership for more information. WITI Members: Visit the Members' Area for discount information. The WITI Hall of Fame was established in 1996 by WITI to recognize, honor, and promote the outstanding contribution women make to the scientific and technological communities that improve and evolve our society. Join us in New York City in 2005 for the Tenth Anniversary Celebrations. Accenture is the world's leading management consulting, technology services and outsourcing company. We bring together the unique experiences and perspectives of a diverse workforce to deliver cutting-edge technologies and solutions to companies around the world to help them become high-performance businesses. That means we help them find ways to become more successful in every part of our business from strategic planning to day-to-day operations, making them more competitive in their market. We have over 100,000 people in 48 countries and work with clients in nearly every major industry worldwide, including 87 of the Fortune Global 100 and over two-thirds of the Fortune Global 500. With such a dynamic environment, there's always a chance for growth and opportunity - which means you'll gain more insights and skills than virtually anywhere else. Search for Accenture jobs on WITI4Hire. This position will provide advanced technical support to other technical support providers by resolving issues related to Windows desktops, network connectivity and centrally provided services. You will also research and resolve technical issues related to Windows desktops, network connectivity and centrally provided services. Jump Start Your Career Development in 2005 at WITI's Career-Wise Lollapalooza! Meet the first Computer programmers, the "ENIAC women ", history of women in computing and comments on Harvard President Summers remarks. Speaker Series: "How to Consult and Make Money at It!" Speaker Series: "7 Secrets To Sales Success in 2005"